MUSIC REVIEW: Nightwish, "Endless Forms Most Beautiful"
Now that’s I’m talking about. Endless Forms Most Beautiful, the newest album from Finnish symphonic metal band Nightwish, is their best album since 2004’s Once. The band seems rejuvenated and full of energy, fresh off a set of lineup changes, including their third singer in nineteen years, the addition of a pipes/whistle player, and the substitution of their longtime drummer for the recording of the album and coming tour. 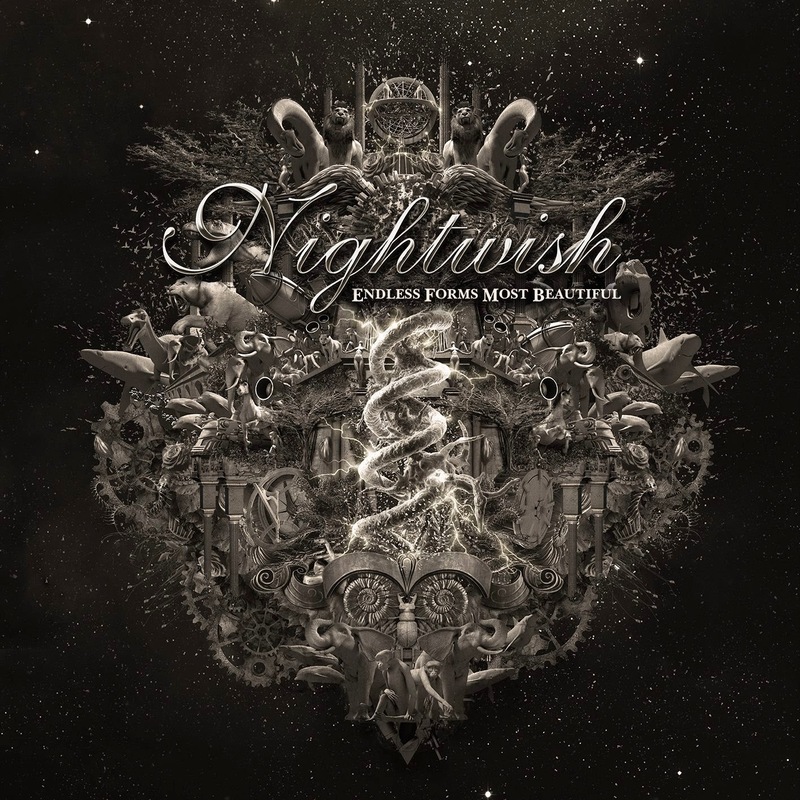 Full of moments both heavy and lighthearted, with a wide variety of tempos and melodies, along with the poetic lyrics of keyboardist/bandleader Tuomas Holopainen, Endless Forms Most Beautiful is top-shelf Nightwish with “endless” amounts of replay value. Some background: The band unceremoniously kicked out Tarja Turunen, the original Finnish singer, who was the voice of Nightwish until after Once’s release. After a long period of auditioning, they hired Swedish singer Anette Olzon. And thus the so-called “Nightwish Reborn” era began in 2006-2007, during which the albums Dark Passion Play (2007) and Imaginaerum (2011-2012) were released. Anette, a pop singer, was a widely controversial choice to replace Tarja’s operatic vocals, which arguably made Nightwish the successful band they are today. Anette was ultimately not the best fit for the band, and was replaced in 2013 by Floor Jansen, a Dutch singer with more metal experience. Troy Donockley, who had played the Uilleann pipes and tin whistle on Dark Passion Play and Imaginaerum, was added as a permanent member around the same time, turning the longtime quintet into a sextet. After parting ways with Tarja, it can be said Nightwish fell into an emotional and creative nadir, which was reflected in the uneven but affecting Dark Passion Play. Imaginaerum was an overall more consistent album, but with fewer memorable moments, and suffered from its rigid, childlike concept and tie-in film, which apparently seemed like a good idea to the band members. Now, with a new singer and new piper/flautist, Nightwish seems to be back on track, and it shows with Endless Forms Most Beautiful. Endless Forms Most Beautiful is arguably Nightwish’s happiest album since 2000’s Wishmaster, taking its title from Darwin and the themes of evolution and nature as its inspiration, infused with wonderment and a quasi-mystical air — a much richer theme than Tuomas’ infatuation with lost youth and childhood. Featuring the support of a full orchestra and choir, like the previous several albums, the band’s sound on this album is richer and fuller than ever, with plenty of concessions to longtime fans such as myself, including lyrical and musical references to some of their earlier enduring songs. The opening number, “Shudder Before the Beautiful”, opens with a short spoken-word introduction before kicking off with a dramatic flourish, providing one of Nightwish’s strongest opening tracks ever, with a catchy rhythm reminiscent of Once’s opener “Dark Chest of Wonders”. “Shudder” sets the listener up for the overall concept of the album—a celebration of the Earth and all its biological wonders—and prepares the listener for the album’s expansive symphonic sound. While Nightwish’s heaviness has arguably declined in recent years with what sometimes veers on an over-reliance on the backing orchestra, the early tracks “Weak Fantasy” and “Yours is an Empty Hope” respond with the intense sound that many listeners have been craving, with newly invigorated musicianship from guitarist Emppu Vuorinen and bassist Marco Hietala. The latter song particularly references the band’s heaviest song, Dark Passion Play’s “Master Passion Greed”, and both succeed well, despite deviating emotionally and lyrically from the overall joyful and celebratory nature of the rest of the songs. The third track and first single “Élan” is probably Nightwish’s most earworm-y song in years, and belongs on the same level as similarly popular singles such as Once’s “Nemo” and Dark Passion Play’s “Amaranth”, and begins a running theme throughout the album of the idea of early more mystical beings predating humanity as we know it on the earth, with entreaties to “leave the sleep and let the springtime talk/In tongues from the time before man.” Overall the song has a rousing folky quality enhanced by judicious use of Donockley’s flute, and will likely be played at every Nightwish concert for the foreseeable future. The following song, the title track, is perhaps the most invigorating and exciting song on the album. Borrowing symphonic elements of some of Nightwish’s most energetic songs, “Endless Forms Most Beautiful” is the crystallization of the themes of the album as it encourages the listener to stop for a moment and appreciate the miracle that is the existence of life on Earth—all its wonders on this “special speck of dust”—all the “endless forms most beautiful”—to be “alive, aware, in awe/Before the grandeur of it all.” “Alpenglow” also continues this epic strand running throughout the album, continuing the lyrical themes of “Élan” and foreshadowing elements on the album’s final track. Nightwish wouldn’t be Nightwish without an absorbing ten-plus minute track, and Endless Forms Most Beautiful delivers, with Nightwish’s longest song to date, the twenty-four minute “The Greatest Show on Earth,” which features one of Nightwish’s best choruses to date, along with more spoken word segments (though nothing quite as awful as Imaginaerum’s unbearable “Song of Myself”), continuing themes both musically and lyrically from earlier on the album and providing a fitting close. Overall, the addition of Floor Jansen’s vocals makes this album and ensures its overall success. Her voice, capable of the lightness of Anette’s, the operatic quality of Tarja’s and the emotional capacity of fellow symphonic metallers Within Temptation’s singer Sharon den Adel, is the best part of the album. She displays her incredible stylistic range across the album’s ten songs with vocals (out of eleven total), often using both harsh and melodic vocals within the same song (“Weak Fantasy”, “Yours is an Empty Hope” and “Alpenglow” best show off this tendency). She is capable of incredible delicacy and tenderness, as demonstrated on the ballad “Our Decades in the Sun”, and she holds her own against the instrumentation behind her as well as the choirs and occasional vocals of bassist Marco Hietala, with whom she gels rather nicely. The addition of Troy Donockley at first worried me—I thought Nightwish was going full Celtic—but luckily, his appearances are extremely judicious and well-used. In fact, the only disappointments for me on this album are the songs that simply are not as remarkable or well-crafted as their more incredible counterparts, as well as the overall blandness of the drumming and some of the guitar and bass. However, while the quality of the instrumentation is a large step up from the previous two albums, there are moments where Emppu seems to be phoning it in, or where Marco can barely be heard (though that more likely points to choices made in the mixing of the album). Additionally, the presumptive second single (and planned first single, for some reason), “Edema Ruh”, a perfectly catchy mid-tempo song, lacks the same oomph as songs like “Shudder Before the Beautiful” and “Endless Forms Most Beautiful” and just isn’t that memorable in comparison. “Alpenglow” starts off incredibly well, but is rather disjointed in sections, especially with regards to the lyrical melody, and contains just a bit too many changes for a song under five minutes. The instrumental track, “The Eyes of Sharbat Gula,” is beautiful but slightly boring, and features a children’s choir, an element I encourage Nightwish to cease using (though Imaginaerum is most guilty of this crime). And lastly, while much of “The Greatest Show on Earth” has the potential to be Nightwish’s greatest long song, it unfortunately peters out around sixteen minutes, changing from a strong epic with, again, a truly excellent chorus, to a slow instrumental with animal sounds and additional spoken voice. The spoken word aspect of this album brings me to what is another problem I have with Endless Forms Most Beautiful: the inclusion of evolutionary biologist Richard Dawkins as the guest speaker on the album’s opener and closer. While famous for his contributions to science, Dawkins has revealed himself to be extremely contemptuous of religion, especially Islam, and has demonstrated misogynistic tendencies; it is slightly jarring for my favorite band to seemingly endorse his behavior and ideas by including him as a central feature of the album. Overall, however, the merits outweigh the detractions. Endless Forms Most Beautiful is Nightwish’s best album since the departure of Tarja, and, with time and more listens, may well join Once and Oceanborn as one of my personal favorites. Songs like “Endless Forms Most Beautiful”, “Élan” and “Shudder Before the Beautiful” will likely stay in the band’s concert rotation for years to come. While not a fan of the artists, I am a fan of the review. Nice analysis!